Happy New Year!! I can't believe one month of 2019 is almost over! I just returned from our RNC Winter Meeting in New Mexico. It was a privilege to be surrounded by majestic snow-capped mountains of Albuquerque and to be representing each of YOU to the rest of the RNC members! 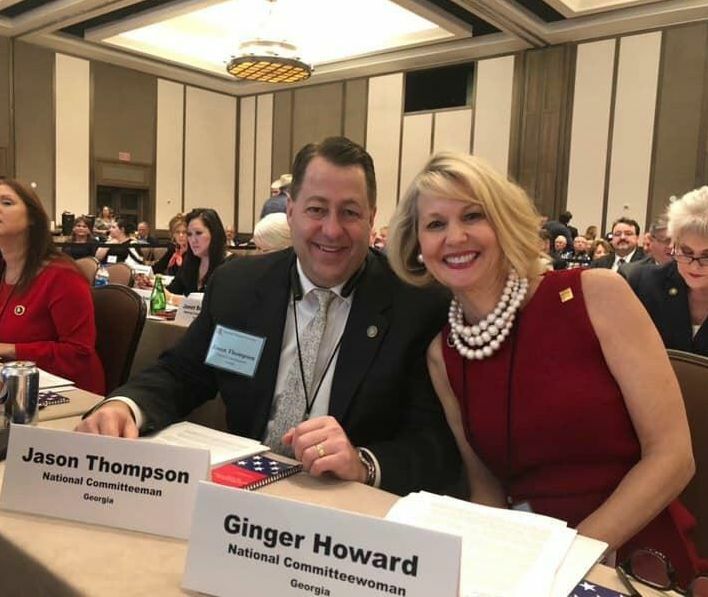 This was Jason Thompson's first RNC meeting, and he was ratified with the other new members and welcomed during a special reception. We've got a great Georgia team! I arrived early for our Conservative Steering Committee meeting, which is a group not affiliated with RNC but made up of RNC members. We met with John Fund and the Committee members from California, discussing voter fraud and the new law in California called ballot harvesting. Several Republican candidates were ahead in the few weeks and even few hours leading up to the November 2018 election, but they ended up losing because of this awful bill signed into law by Governor Brown in California. And don't think the same thing can't happen to us here in Georgia. We have LOTS of work to do!! Another panelist at the meeting was Heather Higgins, Chairman of Independent Women's Voice, and she gave a wonderful talk on how we need to change our messaging, especially towards women. I hope I can get her to come and speak to our GA GOP! 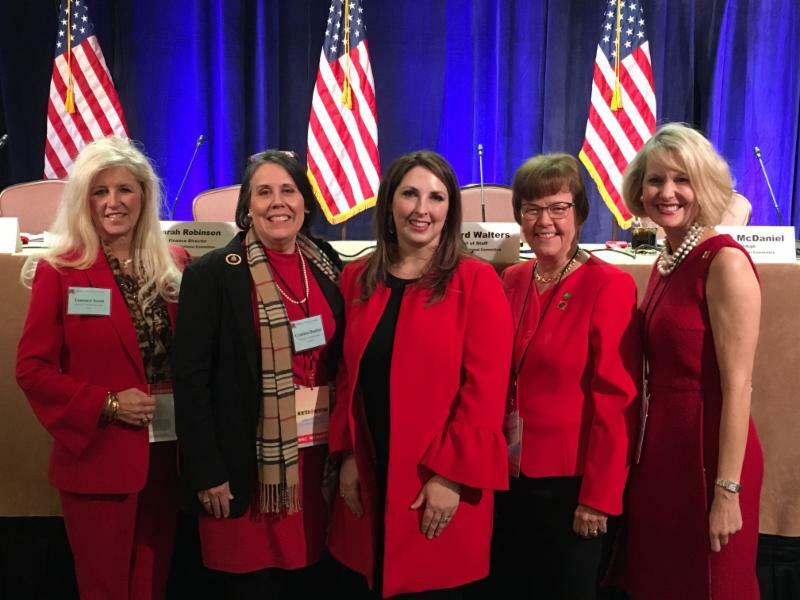 We had re-elections for our board, and President Trump asked Ronna McDaniel to stay another 2 years, as she has done an amazing job. We have fundraised a record-breaking $317 million and outspent the DNC by $147 million. We have zero debt and the DNC has $3 million in debt. You can find Ronna's remarks to the RNC here if you would like to know more details of our party's ground game and data. I was asked to give the seconding nomination speech for our new Co-Chair, Tommy Hicks, and I was so honored to do so! When Tommy traveled to Georgia with Donald Trump Jr in 2016, I had the privilege of meeting him and introducing Don Jr at a campaign stop in Fayette County. Tommy is originally from Texas, and he moved his family to DC where he has been running America First Superpac. He is a close friend of the Trump family and a loyal supporter. He will be a great asset to Ronna and the team. We also elected a new treasurer, Ron Kaufman, NCM from Massachusetts, and a new secretary, Vicki Drummond, NCW from Alabama. So, my friends, the proof is in the pudding, as they say. President Trump has delivered on his promises and is fighting hard for us. Thus, I was happy to co-sponsor a resolution supporting our president. The resolution had 90 co-sponsors, more than any resolution ever passed, showing how unified the RNC is behind our president. 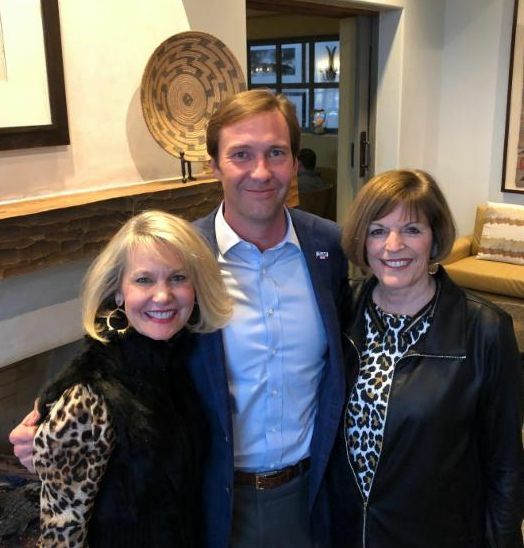 Closer to home, it was wonderful to attend the Inaugural events for our 83rd governor of Georgia, Brian Kemp. The prayer service was so glorifying to God, and I am so thankful that we have a Governor and First Lady who honor God and put Him first. The swearing-in ceremony and gala were wonderful times of celebration and joy after such a hard fight! Join me in praying for our First Family for wisdom and guidance as they lead our great state. Thank you all for your hard work and dedication to our party. I am grateful for each of you and pray this is a year of blessing for you and your family. 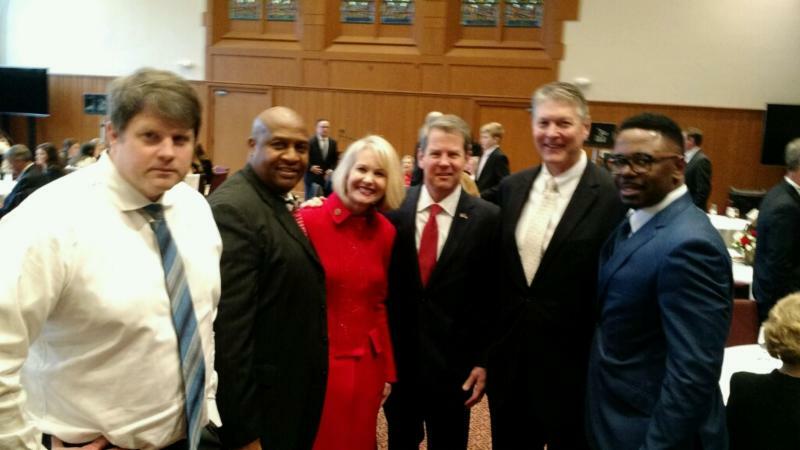 Ginger with Brian Kemp on his swearing in day, along with pastors at the prayer service.